Thanks for clicking in. It is your comments that have kept me posting boxes on Lumber Jocks the past six years. So, have your say. I will respond to all comments so check back for feedback. Pictured is a valet (11 3/4 x 7 1/2 x 6 1/4 ). The top and corner splines came from a burl that grew on the side of a local Red Maple tree. 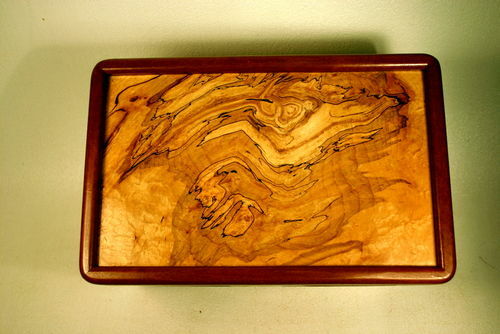 (Local means Southern Indiana) The tray and inside rails for the tray came from some local spalted maple wood. The sides were made from a Macore tree that grew in Ghana, Africa. I think the Macore’s rich brown color does a nice job of picking up the tones in the Red Maple burl. The Top: A burl is a bump on the side of a tree. This came from a very old tree and was a very big bump. A burl is the tree’s attempt to heal itself, usually after an injury or insect invasion. As you can see it has a very wild grain. The darkest lines are caused by a fungal invasion, some lines were the result of a fire. Some lines are a bark inclusion. Overall this 200-year-old tree was a survivor. When the last branch died, my neighbor cut this Maple down, and I asked him to chainsaw off this burl. He gave it to me after saying that it was mighty poor firewood. I agreed. After letting it dry for a couple of years I sliced it into slabs on the band saw and then ran it through my dual drum sander to see what I had. I don’t think I’ll ever tire of looking into the souls of trees and being amazed at a tree’s inner beauty. 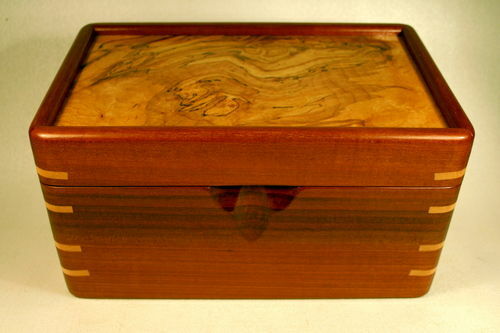 Since burled wood is often fragile, it was a good idea to encase the sides with a frame by setting the burled wood in a dado that runs around the box. Before adding the burl slab to the box the softest parts were treated with super glue that soaked into the wood and stabilized it. I also gave it several coats of Minwax Tung Oil. It really soaked up about 6 coats of finish. Only then was it ready to be sanded and fitted into the box. The Sides: Macore is a wonderful wood to work with, it even smells good when you work it. Macore finishes beautifully and cuts crisply. This piece of Macore has several shades in the grain that give this valet an exceptionally rich look. I made this box especially deep because I wanted to use as much of this beautiful board as possible. 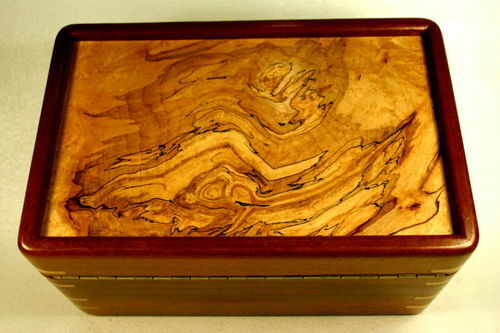 The spalted maple tray has Macore corner splines and removable dividers. The dividers are made from Venetian blind slats. The link will explain the technique. Hey, you can join in too. Keep boxing and keep posting. Very nice! I love the top. That burl top is just lovely, Al. Stunning! Nice job showcasing its beauty. Very nice! My father in law gave me a cherry burl from his property, which I sliced up into 2” thick pieces on my bandsaw about a year ago now. I was hoping to make a box similar to this one once it’s fully dry! I don’t own a drum sander though, so cleaning up the surface will be tricky. Belt sander and random orbital sander, I guess. 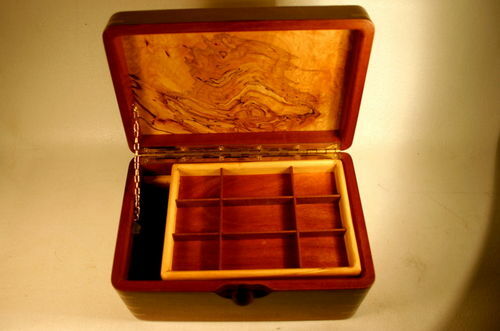 The whole box is minwax tung oil finish? Looks nice – I may have to try that stuff at some point. very nice the wood is beautiful is it just from your state or does it grow farther west. again great job. -- Terry Uncle Buck Carvins "woodworking minus patience equals firewood "
Morning Boxguy, This last box is as usual MAGINFICENT!. 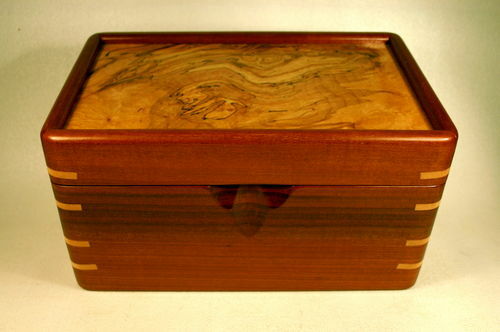 Your e=selection of choice woods with terrific paterns certainly adds to your ability to construct, craft these boxes. Thanks for sharing, I’m an avid admirer. Amazing grain and, as always, true to your rule: make the inside as interesting as the outside. Another beautiful box, Al. That’s a great wood combination, and the burl is fantastic. It’s something that those ugly lumps I see on trees hide such inner beauty. Love the wood patterns and learning about new woods, very nice. Great job on the valet. Great choices for wood combinations. Your a master. 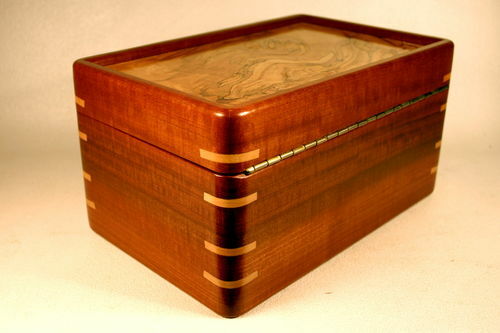 A beautifully made box and a great way to join in his graduation celebration. 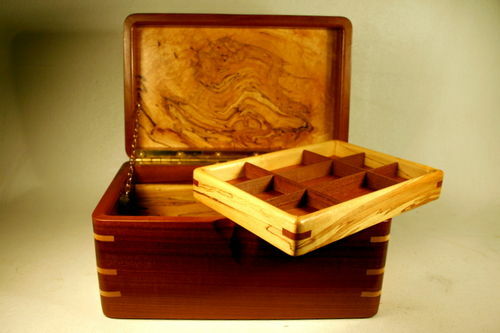 The wood on the top gives this box a really nice look and when the top is up I like how the tray sides are made in a lighter wood for some nice looking contrast with the separators. Great looking box Al! I like the depth, the young man will certainly have enough room to keep his valuables for some time. I have not been on LJs much these days but continue to build. Perhaps I’ll find my way back. Thanks for posting. Al, beautiful job of highlighting a special piece of wood. It deserves it. Beautiful box. Love the grain in the top, and craftsmanship is top notch.